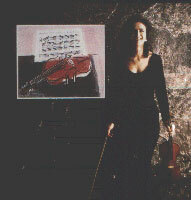 October 2007 saw the return to Cardiff of this highly individual festival devoted to 'everything violin', receiving extensive national media coverage. There is no festival in 2008/9. The Red Violin is the brainchild of internationally acclaimed soloist Madeleine Mitchell, who created the original event ten years ago, celebrating the violin across the arts. 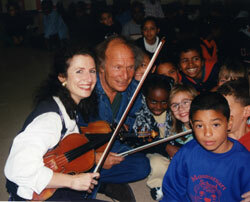 The 1997 event packed houses and created new audiences, with extensive media coverage. Red Violin will feature the fiddle in concerts, exhibitions, films, workshops, talks and an educational programme for all ages, in an inclusive and eclectic festival staged throughout Cardiff in collaboration with St David's Hall, Wales Millennium Centre, BBC National Orchestra of Wales, Chapter Arts, Cardiff University, The Norwegian Church, Live Music Now, Arcata, RSA, Royal Music Colleges in London, Glasgow and Cardiff, Welsh Jazz Society and the BBC. Star performers included the young Latvian violinist Baiba Skride in Stravinsky Violin Concerto for the BBC, one of the country's most distinguished baroque soloists, Brecon-based Rachel Podger, and Artistic Director Madeleine Mitchell herself - 'one of Britain's liveliest musical forces' (The Times) - performed the world premieres of 2 works in her remarkable collaboration with percussion group Ensemble Bash - FiddleSticks and launched her latest CD of popular 'Violin Songs' www.divine-art.com featuring Elizabeth Watts, winner of Cardiff Singer of the World 2007 Song Prize, in a recital at St David's Hall. Other Red Violin events included charismatic folk fiddling, mesmerizing Indian Carnatic violin, jazz violinists in informal settings and brilliant young violinists from some of the leading UK music colleges and the Yehudi Menuhin School as well as outreach settings. The Red Violin was launched on 1st October by the unveiling of 'Big Ffidil' a unique 'sounding' model violin devised by Madeleine Mitchell, in the WMC main foyer installed by composer Stuart Jones (who supervised the RPS Award-winning Virtual Orchestra at the South Bank Centre), followed by a Welsh Assembly Senedd performance for multi violins based on a theme by Menuhin, against slides of 'Le Violon Rouge' by Dufy and other violin paintings by Picasso etc. Events continued for 9 days, in a whole range of formal and informal Cardiff venues all brought together by Madeleine Mitchell to explore the magic and versatility of the violin. The fiddle is said to be the closest to the human voice, and this was explored in local schools prior to the festival with an educational programmes entitled The Violin Sings / Canu'r Ffidil with Madeleine and baritone Jeremy Huw Williams. 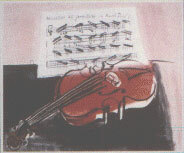 Children were encouraged to play violins, sing and create their own Red Violin paintings for public display. Red Violin is supported by ACW, ACE, RCM, Britten Pears, Alwyn and Hinrichsen Foundations, Asian Music Circuit, Ty Cerdd, Friends of Red Violin and all the venues.